Dear Home Office starts with a clip of its young company gathering in London and making their way up to Edinburgh. 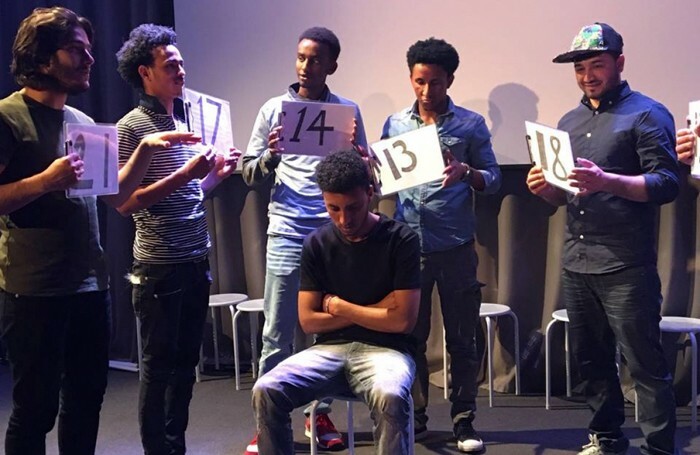 Yet another journey has begun for these real-life unaccompanied refugee minors who now line up onstage to introduce themselves in a ripple of fragmented yet connected information. It’s a motif that’s repeated throughout this devised piece where stories overlap and interweave to create a single out-of-the-ordinary everyman’s tale. Eight of the ten-strong ensemble are young males – Somalian, Afghan, Eritrean, Albanian – their teenage confusion vying with fierce pride as they explain the perils of staying back home, the dangers along their roads to our shores, the pitfalls of passing though the UK’s red tape and then adapting to an alien life. There’s the idea of Babel in the barrage of court interpreters, in the frustrations of trying to prove how old they are, the danger and boredom of detention centres, the bewilderment at foster homes, semi-independent accommodation, appropriate adults, internet safety workshops, house rules, curfews, English lessons – and then the courts and countless departments involved in the asylum process. The Home Office is not seen as a sinister force but faceless, as actors in white masks personify its officials – and as the lads jump through the hoops of red tape, they pass no judgement. This is a classic workshop format that uses a range of genres, often turning to physical where words won’t work. The strength lies in the narrative created by the combined journeys made by the cast – for example, the artistic journey is affirmed through videos of the group as they rehearse and workshop. The young untrained performers acquit themselves awkwardly but confidently and impress with the instant rapport they establish with the audience. Heartwarming, educational and humorous, this is a bold piece of theatremaking that works admirably to win over the huge audience out there who want to hear its emotive message.